Here we have the big screen adaptation of “The Green Hornet,” which began as a popular radio series and even spawned a short-lived TV series starring Bruce Lee. This had potential to be something of an action thrill ride, or at least a comedic, campy take on the usual superhero formula, but what we end up with is something much less: a directionless, pointless backdrop for blowing things up with some martial arts thrown in for kicks. The story revolves around Britt Reid (Seth Rogan), son of James Reid (Tom Wilkinson), the owner of a large newspaper. Britt is spoiled beyond belief and doesn’t appear to be doing very much with his life. Suddenly, his father dies from a supposed bee sting, leaving him the run of the newspaper. Knowing this is not something he would be particularly good at, he leaves it in other hands and returns to his usual, slovenly ways. This leads him to a run in with one of his father’s employees, Kato (Jay Chou), with whom he forms a sort of brotherly bond….all over a cup of coffee. Just for kicks, Britt suggests they go out and steal the head from a statue erected in his father’s honor, but instead, they end up saving a couple from being robbed. This gives Britt the idea that they should become crimefighters posing as villains (I know, I know, it makes no sense. Kato even points out how both criminals and the police will hunt them down, but to no avail). Donning masks, Britt becomes “The Green Hornet,” while Kato becomes…well, his superhero name is never decided upon. Their crimefighting escapades capture the attention of the biggest crimelord in LA, Chudnofsky (Christoph Waltz), who, in his effort to keep control over the crime of the city, decides to have both of them eliminated. To begin this film’s long list of flaws, it was presented in 3-D. But this wasn’t just any 3-D. This was the flattest 3-D they could have possibly done. It looked like there were a couple of times that they tried to add a little depth to some scenes, but for the most part, the picture stays right there on the screen, where it should have stayed in the first place, without much of anything coming out towards the audience, making this the most pointless use of the extra dimension I’ve seen yet. 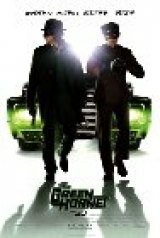 “The Green Hornet” wasn’t exactly a title that screamed out 3-D in the first place. One of the film’s biggest problems was in its lead, Seth Rogen. He tries to be cute, charming, and humorous, but what he ends up being is dull, irritating, and unfunny. These are not traits you want your main character to have if you’re planning on having the audience like them. Rogen constantly motormouths lines of dialogue that make you want to scream at him to be quiet for a whole 15 seconds. This leads to several scenes that are extremely verbose, all due to his character being unable to let others get in more than a word or two. It comes as no surprise that he co-wrote the screenplay. No wonder he ends up saying so much. Speaking of the performances, two great actors make appearances, one of which you might miss if you blink. Tom Wilkinson makes an incredibly brief cameo (two scenes) as Britt’s father, who is disappointed in the way his son is living his life. The other great actor is Christoph Waltz, who you may recall won an Oscar for his brilliant performance as SS Colonel Hans Landa in “Inglourious Basterds.” Though Waltz is in the film for a longer time than Wilkinson, he’s still not in it all that much, thereby never really getting much of a chance to show his talent. The one reason that this film looked like it had a chance of being good was because of his presence, and yet, he’s seriously under-utilized. What was the point of bringing in Wilkinson and Waltz, actors of enormous caliber, if you’re not going to put them to good use? The film’s humor also left a lot to be desired. The trailers and TV spots used up most of the few comedic spots that worked for the film so that when they came on screen, barely a laugh was heard. The most amusing scene happens to be very early on in the film and involves Waltz’s one and only chance to let his villainous side shine. From here, the laughs seemed to dissipate along with all the gas shot from Britt’s gas gun. The story leads up to a large, climactic chase scene where an LA freeway has been convenient cleared right down the middle for easy access. This sequence tries to amp up the excitement and throw in some of those thrills that we’ve been waiting for for nearly two hours, but sadly this sequence turns out to be long, tedious, and dull. You know a movie is in trouble when cars are chasing each other, bullets are flying, various objects exploding, and all it gets in return is yawns. It’s hard to believe that this comes from director Michel Gondry, who gave us such fascinating films as “Eternal Sunshine of the Spotless Mind” and “The Science of Sleep.” Luckily, he had nothing to do with the screenplay, so, in a sense, you could call this his “Cop Out.” Hopefully he collected a hefty paycheck and will now go back to making thoughtful films that will rid our memory of this experience. 1.5/4 stars.